Editor’s note: The Epoch Times here publishes direct translations of statements made by Chinese people in renouncing the Chinese Communist Party (CCP) and its subordinate organizations. Statements such as these are submitted to a website affiliate of the Chinese version of The Epoch Times, Dajiyuan. The movement to renounce, withdraw from, or quit the CCP, called “Tuidang” in Chinese, began in late 2005, soon after The Epoch Times published the Nine Commentaries on the Communist Party, an editorial series that explores the nature and history of the CCP. The statements offer a rare and candid glimpse of history in the making. The Chinese people are turning their backs on the Communist Party, choosing conscience over convenience, and peacefully ushering in a future China, free of Party rule. The following is a selection of edited Tuidang (“quitting the Party”) statements made by Chinese nationals on June 23, 2012. My parents, my wife, and I are not communist party members nor are we government officials. Although I was made to join the Young Pioneers and Youth League in school, I now solemnly declare that I draw a line between myself and the communist party. I am now free. I don’t believe in communism or the communist party! I love my country deeply. China is a country with a long history, splendid culture, vast territory, and kindhearted people. But I hate the rogue communist party, which monopolizes our political rights, rapes Chinese citizens, and has ruined Chinese classical culture. Under communism Chinese society has become so corrupt that it is tragic even for pigs and dogs to live in today’s China. As the communist party officials’ morality continues to decline, the wisdom of the common people has grown. I would say that Chinese people are no longer like they were before. People can help sustain a government, they can also overturn a government. Awakening Chinese want a revolution and want the Communist regime to step down from the stage! As a family of four, we announce our withdrawals from all the communist organizations that we joined before. I am a farmer, and I know how evil the communist party is. My grandfather was persecuted to death during the Cultural Revolution. In order to clean away the mark branded on me by the evil, I want to withdraw from the Young Pioneers that I previously joined. 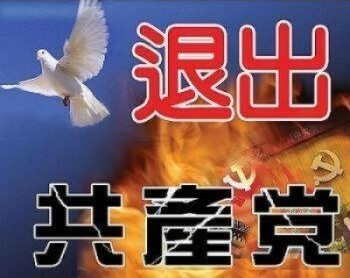 No matter how the evil CCP plays all its tricks and blows its trumpet, this vicious party can bewilder people no more. People all over China are cursing this evil Party. People can be heard everywhere, on trains, in cars, while playing Mahjong, on the Internet, all are scolding this vicious party. The CCP has become extremely unpopular in China. We hereby solemnly announce that we quit all of the CCP’s affiliated organizations and therefore erase the evil mark of the beast. As soon as God destroys the Communist Party, China will have a bright future. Elementary and high school students are unable to see the truth because they were deceived by the CCP’s education. I hereby write down my dream: I will learn new technology and break through the communists’ Internet blockade so that everyone can enjoy their rightful freedom again. Let everyone realize the truth which is blocked by the CCP! The evil party is doomed to perish! I hate the communist bandits! I have been a party member for more than a decade and I joined the Youth League some 20 years ago. I thought that it was unnecessary to withdraw from the Youth League, but I am ashamed of myself whenever I recall the disgraceful experience. I regret that I could not see the CCP for what it is, and I am also very remorseful that I was so easily brainwashed into joining it. Thanks to this great website, I wish to publicly announce that I withdraw, and I clear myself of that painful memory. May God forgive my naïve ignorance! May God and people acknowledge my profound regret! I didn’t know how vicious the CCP was, and in my ignorance I actually felt honored to join the Party. I know that I am not a true descendant of our traditional Chinese heritage if I don’t quit the party right away. I hereby solemnly swear before God that I withdraw from the CCP, Youth League and Young Pioneers. I also hope my family and relatives will understand the truth as soon as possible.